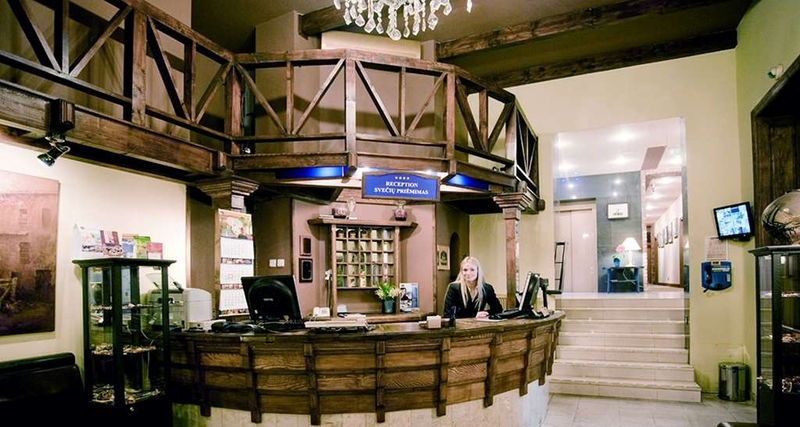 The Best Western Santakos Hotel is ideally located in the center of Kaunas. Come and experience our hotel near the major tourist attractions. Best price guaranteed and exclusive deals. A cozy sitting area in our lobby. King size bed in this suite and nice view. Suite with a fireplace and terrace. View from the sitting area of one of our suites. Stay at this stylish, charming hotel ideally located near the unique museums, churches and historical heritage of Kaunas, Lithuania! 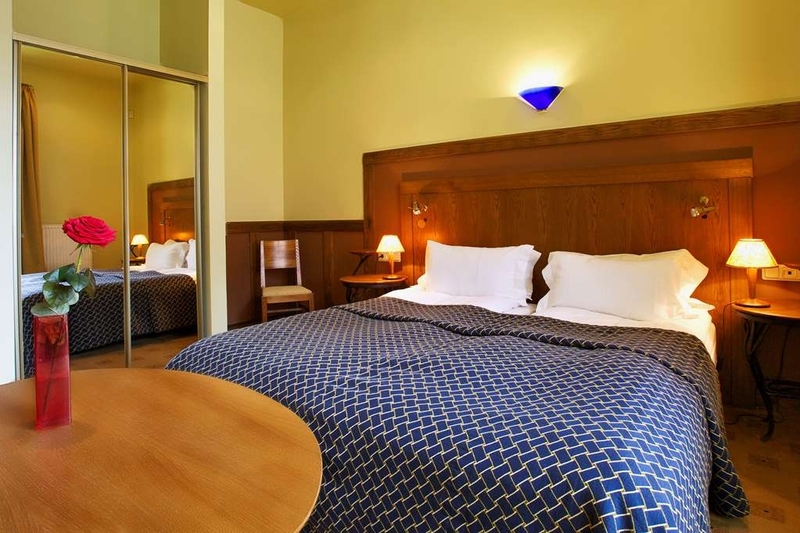 The Best Western Santakos Hotel is delightfully situated on a calm and quiet street in the heart of Kaunas, the city considered the most Lithuanian town in Lithuania. 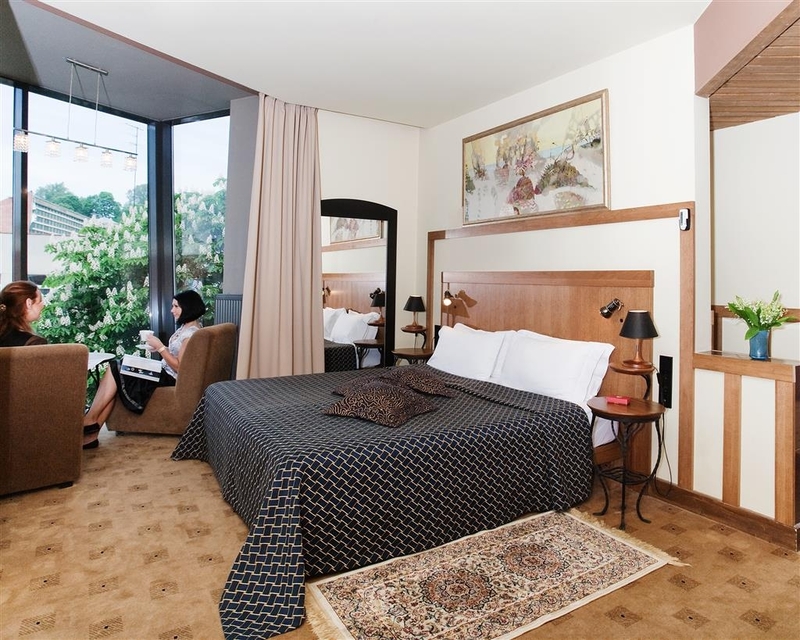 Hotel guests experience this rich Lithuanian culture through the area's many popular music festivals including Kaunas Jazz Festival, Pazaislis Classic Music Festival and the International Festival Operetta in Kaunas Castle. More popular local events for visitors include the International Modern Dance Festival and the Euroleague Basketball Tournaments. Santakos Hotel offers all the right amenities for business and leisure complete with a modest ascetic red-brick exterior and cozy, decorative interior. Each well appointed guest room features cable satellite television, coffee/tea maker and AM/FM alarm clock with balcony, fireplace and patio rooms available upon request. Hotel guests enjoy a complimentary full breakfast and taking advantage of the hotel's Finnish sauna and indoor swimming pool. Additional highlights include a gift shop, meeting and conference facilities. The staff of the Best Western Santakos Hotel is always ready to provide exceptional service to hotel guests. For a home away from home while traveling, make an online reservation today at the Best Western Santakos Hotel in Kaunas, Lithuania! Enjoy your stay. Nice hotel with big room. Room are a bit strange organised, but this is probably to design and combination of different buildings. You can have a room on the fifth floor, but you have to take the elevator to fourth floor and the stairs a bit further. Breakfast was ok and the restaurant in basement also. I am not a picky traveller and there are only very few things that are important to me while travelling. Food and comfort are on the list. This hotel is great otherwise (WiFi, parking...). However, I was slightly under-impressed by breakfast: we got there at 10 and pancakes were a bit dried out and the overall selection was just ok. The room has a bath and a toilet separately. On one hand it is good (no need to queue), but in the other hand it is logistically challenging in the middle of the night to remember where to go. Also, it is tricky to have a shower in the bathtub. Possible, but a bit less comfortable. And I did not feel like having baths every single time. The bathroom did have heated floor - that was nice. A pleasant and quiet place where you can spend some nights. If I go back to town for sure that this hotel would be one of my options, the price / quality ratio is in favor of the price. in other words, the quality beats the price. "A good hotel, but nothing special"
Housekeeping was so-so, rooms not properly cleaned, beds not made every day, tea/coffee not replenished on a daily basis, toilet paper not replenished (had to request this!). Radiators in bedroom did not get hot despite being on '5' so the room stayed warm at best (Reception told me to turn the dial up as that was the only heating available). Reception insisted my colleague had not paid for his bedroom when he checked out despite me paying for the bedroom the day before. There is an unpleasant smell between Reception and the Breakfast room (drains?). Breakfast is average at best, and it cannot cope when large coach trips/conferences are on (food is slow to be replenished). Limited choice for veggies & only one coffee machine so queues even on quiet mornings. Location and price are good, but it's a 3 star hotel at best. I had a superior room in 2.nd floor. It was spacious, clean and comfortable in every way. Nice decors and a good bed. It was nice to sit down for a cup of tea on a sitting area next to large windows. Yet there was no noise from the street. Clean bathroom with a big bath tube. Wifi worked well. The breakfast was very good with many fresh products. The coffee machine is a bit tricky but the coffee is good! The service was so-so: everything was solved and answered, but in the morning rush hour when a lot of people were leaving, there were 3 receptionists and only one of them was doing the work, other two kept chatting with each other when the customers were waiting to be served. We had a great room at a great price. Our double room was spacious and very nice. It had an extended area that functioned like a glassed-in balcony. The bathroom was a little odd in that the toilet was in a separate room from the shower but it wasn't a problem. (Both rooms have sinks.) Breakfast was very good with a lot of variety. The front desk people are friendly and helpful. They assisted me with some issues before I arrived and were very responsive. We paid about $90/night considered it a great bargain. "Very comfortable hotel, excellent staff/service, very good restaurant"
My friends from Germany and Slovak Rep stayed in this hotel on my recommendation. We had a dinner together at the hotel restaurant. My guests were REALLY PLEASED by the service - the hotel staff was tentative and kind, which was especially appreciated given that the stay was during the Pope's visit to Kaunas, when all hotels were overbooked and most of the visitors were "non-returning customers", so to say. We were very pleased with the variety of available dishes ad the prices at the hotel's restaurant. The only minor disappointment was limited selection of tap beer titles :( But choice of bottled beer was there. Overall, I always recommend this hotel for my guests in Kaunas. Affordable, excellent service for a 4-star hotel, very tentative and flexible service (parking, food, room service), excellent location. The room was very big and nice. The breakfast was good, with lots of choices. One of the best things about this hotel is that's in a very central location of Kaunas - Laisvės alėja (main pedestrian street) is just a couple of meters away. "Weekend break, good food and a little pool." Situated on the edge of the old town next to a music college. 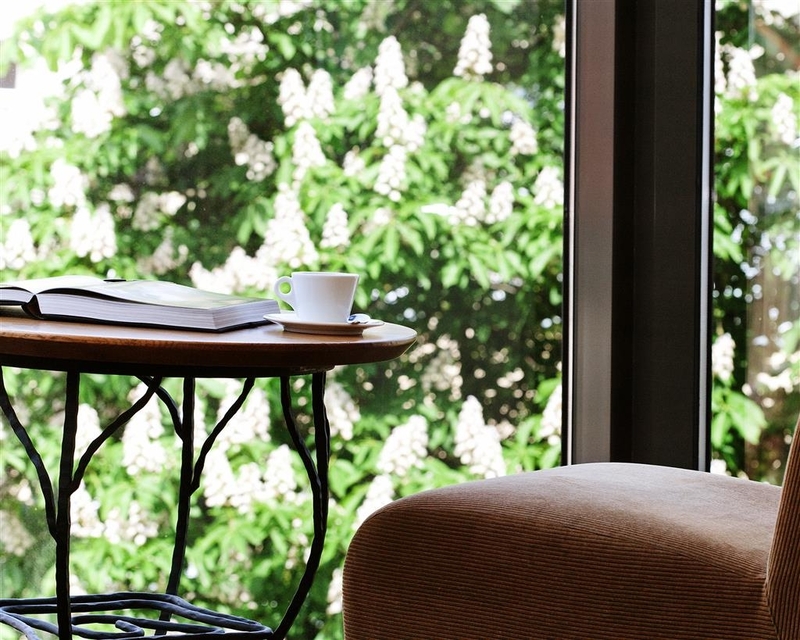 This hotel is bright and modern and well placed for venturing out on foot . The reception area is small but efficient, and check in was fast and went without a hitch. Our room on the third floor had a view of sorts and was light and clean. Lights all worked and plumbing all worked. sheets and towels were fresh and of good quality. Overall room size was good and if anything the air conditioning worked too well. Bathroom was well appointed and tiles/sealant were clean and unbroken. Carpet was clean and there was no smell of smoking in the room. Basic information is in a folder on the desk. Table and two chairs was a thoughtful feature. Breakfast in the morning is served downstairs from reception and is quite comprehensive, if you are after a cooked breakfast then choice is a bit more limited but the basics are there. This area also serves as the hotel restaurant (we didn't dine in the hotel) and there is a small bar here. Beyond the breakfast area is the swimming pool which is free to guests 7am-10am after which it is 15 euro per hour. The pool is small, no getting away from it. I would have given 5 stars if the pool had been a usable size and free to guests at all times. Overall for the price this hotel is very good and in our case things ran very smoothly. After reading the other positive reviews I was disappointed in my stay. I noticed as soon as I arrived in my room that it wasn't clean. There were bits on the floor where it clearly hadn't been hoovered properly, there were salt, crumbs and sesame seeds on the desk from a previous guest's food and when I turned the sheets back there were a number of hairs. There were also cobwebs in all of the corners, 2 live spiders and a shrivelled up dead spider behind the TV. I complained at reception and they said the hotel was full and the cleaners weren't there so I would have to come back later and speak to someone else. When I spoke to them later I was told that the sheets had been changed and the floor cleaned, when I went back the floor was still the same! When I showered the shower tray filled with little black particles, not sure what they were! The room I was in didn't have lift access yet at the bottom on the stairs there were bags of rubbish in the middle of the steps. Kaunas was lovely but the hotel was a total letdown. I wouldn't stay here again. The hotel is a mix of different buildings.Rooms on the 5&6 Floor no acces with the lift.bed and rooms interieur are dated.beds no comfort and the carpet gives alergiek reactionisme.first day breakfast no frech Bread,coffee machine didn,t work very well,choises minimum.Personal not motivated because the most of the gepast stay onlusten for one nigth bussen.I hope that the best Wester in Vilnius other wise I send my Reward card back and wil go o a other chaine Of hotel like Radisson what a differente ! "Big room, air con, great location"
Fantastic hotel, located on a quiet road a few minutes from the old town. Rom was big, air con great, coffee & tea making possible. Free on site car parking. Staff at reception very nice and friendly, The breakfast was plentiful and fresh all in all very good stay at a reasonable price. Thank you for a great stop over. Good location, walkable within town, breakfast ok, room functional, small bathroom with leaky shower, small pool, staff very helpful especially helping with luggage when elevator getting fixed. Good for a stay. "average hotel but value for money"
Kaunas has finally got the money this year (or so it seems) as almost all roads are being paved so getting to the hotel could be tricky. The hotel itself is good, rooms are of decent size and attractions are within walking distance. We had a very large room in this hotel which had lots of Art Deco reminders was clean and relatively light despite there being lots of medium oak. The fittings were mostly good. Strangely we had a separate WC with basin as well as a bathroom with a shower over the bath. I was rather discombobulated by a large picture opposite my bed that my friend and I simultaneously described as "War of the World" in a morose all-over blue. The room was let down by a few details (no towel for the WC, door to the bathroom had to be opened / shut from the bottom and didn't have a handle, shower curtain rings were missing and despite best efforts the floor always got soaked. We over-looked a courtyard belonging to the hotel which was very noisy until late and the hotel itself was noisy all night. 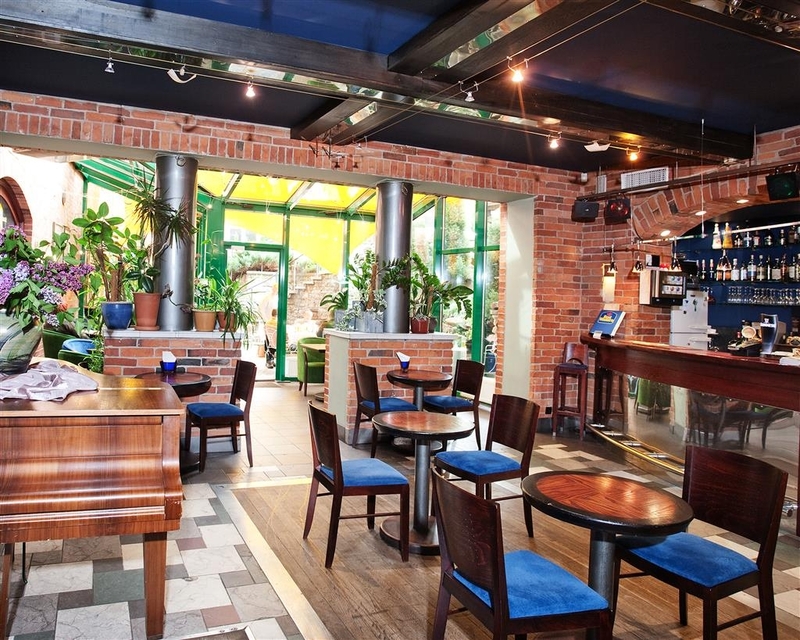 The location was excellent, being close to restaurant, bars and the Old Town. This was one of the better hotels on our trip, hence the 4*. "Some niggles but many good features"
Stayed for a week in June in a suite. They did not have a room with the balcony as we requested and wanted to downgrade us for the same price. When we got to the room the cleaning was still in progress. The girl that seemed to be a housekeeping manager was wearing a short shirt uncovering her whole belly and an open red high heels. Never seen that in any hotel. Most of the reception staff never greeted coming guests and were busy on their phones. The continental breakfast had a poor choice and not really worth paying more for it. The room was nice and equipped but for this price in this city I would expect higher cleaning standards. Overall the stay was pleasant and it could be a great hotel if they paid more attention to details and staff were trained about customer service. Conviently located in mid-town, not too far from the Old Town, this is an independent franchise of the Best Western chain. Difficult to put an age on this building, but everywhere full of surprises. The elegant wooden flooring in the sitting room of the suite was probably late nineteenth century. Bedroom, bathroom and separate toilet early twentieth all adds up to having been a spacious town house. Lots of different sitting areas in the copious basement breakfast area. Breakfast is all you need from fresh cooked breakfast to an unusual variety of cheese and cooked meats. We really enjoyed our stay here. "This could have been great"
Just love the location of this hotel! Close to the main street and the old city. It couldnt have been better! And the size of the room is surely the best I have ever had. So this hotel has all the facilities to make it to 5 points, but even though the staff is friendly enough, they seem to be all young and unexperienced. They dont even look up to greet you when you arrive, they vaccume outside your door at nine on a saturday morning, when they clean (in the breakfast restaurant) they forget their cleaning equipment in the restaurant. The breakfast is not a healthy option. Here they put sugar inn the fresh orange juice for example, but the worst experience was when a waitor came from the kitchen and put her hands inn the bole of veggies : ( Then I couldn't eat that one healthy option that was left. "Mix of old and modern style"
"Great staff and location, a bit worn out premises"
Great location close to the old town. Free internet, parking and dogs. Very friendly and helpful staff. Breakfast was ok, could have more fresh fruit. We had also lunch in the restaurant and that wasn't any good. So I suggest eating elswhere. The floors were a bit dirty in the room, as white socks turned soon grey-brown, when walking on the floor. Toilet was leaking, but they didn't get anyone to fix it. The beds were really hard. I'd still stay here again! "Great place to stay in Kaunas"
We really recommend this hotel as the great place to stay in Kaunas center. It was perfect stay for the buisiness stay. Great location and nice rooms with really profesional staff. We always choose the Best Western when we come to Kaunas for our work. "A very good compromise between quality and price"
I have spent 2 night in this hotel in Kaunas. The building is pretty old, rooms are really clean although they would need to be renovated, especially the carpet. Very high level of service. The staff is friendly and smiley and always at guests disposal for anything they might need. Good quality buffet breakfast with several varieties of food. Nice restaurant for dinner. Perfect location very close to the city center. It is our last time in this hotel, as people who work there don't care about the customer, the front desk in particular. Breakfast became extremely poor, no fresh fruits, only old rotten apples. Waitress say to the customer that Polish cookies which are 3,99 for a huge pack are traditional ones. No regular replenishment. Sad, but probably management doesn't care as well as we have never received any answer to any positive or less positive comment. Choose another places. "Great location and good sleep"
Room was really nice, large and with bath and balcony. I had the best sleep in very comfortable bed! Receptionists were friendly. Breakfast not anything special-not very delicious choice. Pool and sauna really poor. We were waiting the morning to go there, what a disappointment. Good location though- near to the old town, bars and cafes. Friendly and inviting, nothing is ever to much trouble. rooms are comfortable and food is first class. local to great amenities and lovely sights. If its work or pleasure there is plenty of culture to experience in the area and this hotel is the perfect hub. Only stayed one night but really enjoyed it. Perfect room and friendly and professional staff. Breakfast was excellent too. Nice restaurants in the area. One small minus is that they could not iron my shirt for the next morning but this was easily fixed because they could borrow me the flat-iron instead. This was our 4th stop-over in our Epic Journey 2017- Drive from London UK to Mumbai, India. We were pleasantly surprised by this boutique sort of hotel. Just a short walk from the central strip where all the restaurants and entertainment was, and we had a lovely dinner at the friendly posh restaurant for a very reasonable cost. This is a standard hotel. Don't expect anything above average. Rooms ok but dark and could use an upgrade. Bathrooms very small. Some even split with separate bath room and toilet room. Breakfast nothing special. Prior to arriving the staff of the Best Western Santakos Hotel were terrific and exceeded my expectations. They answered every question about the hotel and the area, and secured an event ticket for me. While the whole staff and management were fantastic, Karolina went way above and beyond. The hotel is housed in a historical building but features an elevator, flat screen TV's and free WIFI in every room and other modern conveniences/amenities. I booked a suite and it was spacious and lovely. It had an extended sitting area with large windows overlooking Old Town. There's an extensive breakfast buffet in the Europa restaurant downstairs, featuring a nice selection of hot and cold dishes and nice atmosphere. The hotel is well located and walking distance to shopping, dining, Old Town square and Zalgiris Arena. Best Western Santakos hotel is exceptional and really shines due to its amazing staff. Thank you for an unforgettable stay! "Very nice hotel, friendly staff"
I visited this hotel for one night stay. Rooms are big and nicely decorated, staff is very friendly and helpful. The restaurant was also OK, as well as breakfast. I will definitely come back to this hotel. Good views from top rooms. Very cozy and and good place. Free wifi. There is a restaurant on the ground floor. What i didn't like is that a parking place wasn't big enough to get all cars of all visitors. 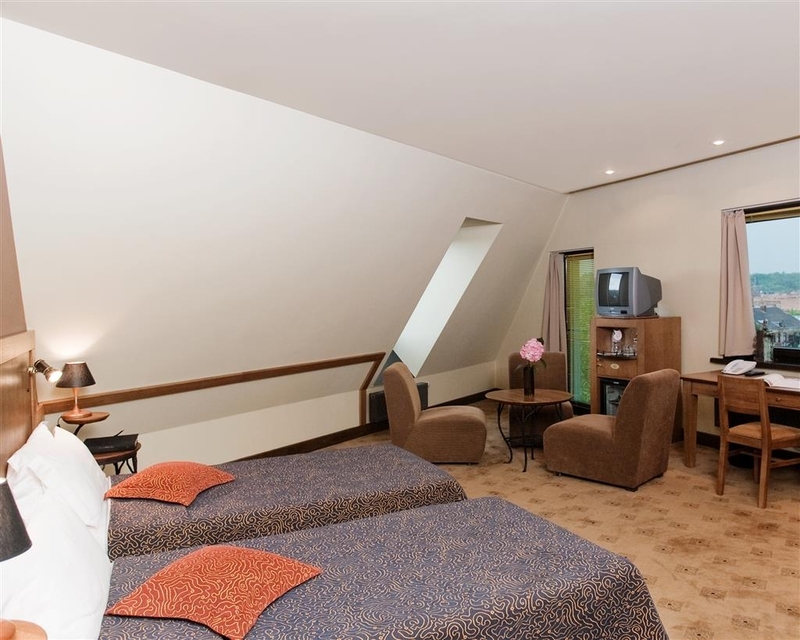 "First class hotel in the centre of Kaunas ... Wonderful stay ... Thank you"
The Best Western is slightly tricky to find if you are coming by car. There are also road works outside (October 2017). However, this is a great hotel right in the centre of town and just a short walk to the historic old town centre. 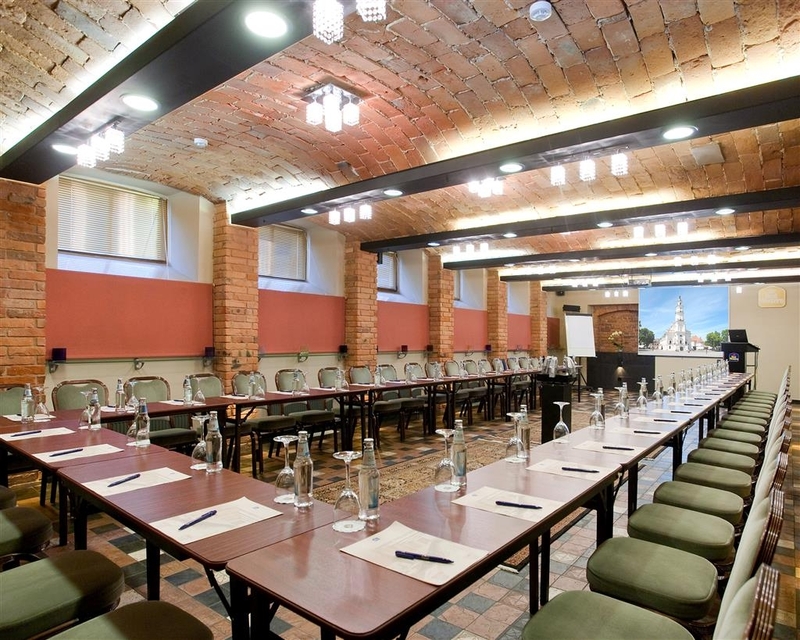 If you want to explore Kaunas on foot then the Best Western is a first class choice. It offers such good value for money. The rooms were very large and impressive. The bathroom was also very spacious. Free car parking was a bonus too. Breakfast was excellent and really good choice of food. All the staff were very friendly. We stayed 2 nights and were very very happy. If you are visiting Kaunas then there's only one place to stay. Big thank you to all the staff. We had booked a suite, with a view and when we got to our room, we were horrified to be facing a brick wall and looking onto a street that was completely dug up and wouldn't have been out of place in a movie. While the later is not the hotel's fault, the room's only view was of a wall! The two doors to the WC and bathroom opened directly into the bedroom and the opaque porthole windows made us feel that we should confess every time we entered! The beds (twins put together) were not very comfortable and the overall feeling of the room was depressing. And don't even get me started on the cheap and broken venetian blinds in the room...get rid of them, please! Fortunately, we were moved the next day to a room on the 6th floor, which had lovely views overs the old town rooftops. But be warned, this room is not for the less the fit. You can take the lift to the 4th floor and from there it is two flights of narrow stairs to the top. Breakfast was nothing special. Out of 10, I would give it a 5 and that would be for the coffee. The best things about this hotel were the location and the friendly staff. I have never liked the Best Western chain and this did not change my opinion. There are much better places to stay so I would suggest giving this a miss. We were appalled by the small entrance of the hotel though perfectly accessible from the Main Street. However, when we again astounded by how cute the decoration was; traditional but unique. The room was sizeable, though, and the bathroom more than “spacious” and fully equipped with a massive bath and surprisingly a bidet. Sleeping in the bathroom was even possible as it was massive enough to accommodate 3 people quite comfortably. The breakfast was highly extensive and the sausages glorious! There were two seating areas; the one in the glasshouse decorated with exotic plants here and there is, thus, highly recommended. The hotel is situated not far from the high street so after checking in you can just easily explore all shops and restaurants. The staff at the reception and the team were all professional, attentive to our needs and kind. WiFi was free and adequate. Overall, we have had such an excellent experience from staying at this hotel. 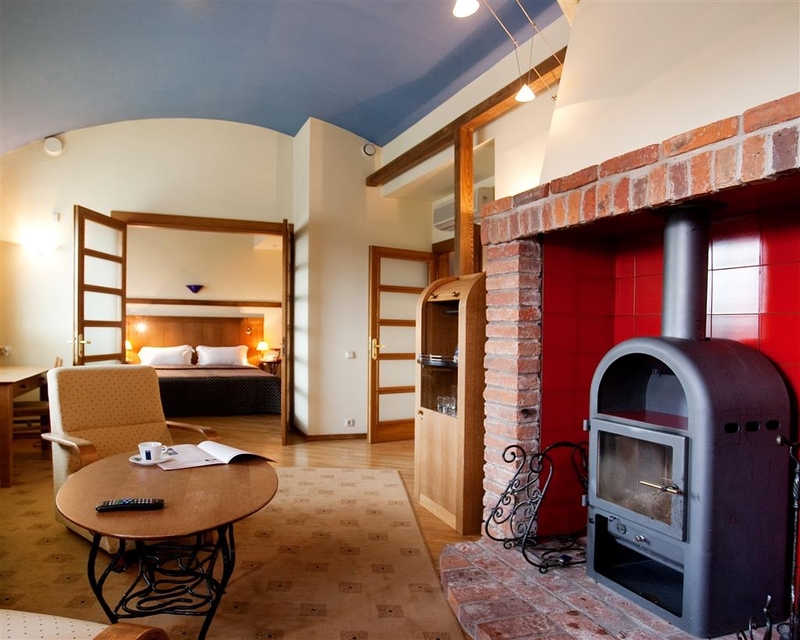 "Good place close to old town Kaunas"
Nice hotel very close to old city center of Kaunas. Good bed and big room. Breakfast is good and there is free parking spaces for your car. Friendly staff that can help you out exploring Kaunas if you want to. Good hotel to stay in Kaunas. My room was spacious and comfortable. Street outside the hotel entrance was under construction and blocked, so it was a bit difficult to guess which way to go to find the restaurants etc. Breakfast was nice and good selection. In my room the TV did not have any English speaking channels, no BBC for news. Staff friendly. "Great hotel, a short walk from the old town"
This hotel is across from St. Gertrude's church, and the front door opens right into the sidewalk. It looks very plain from the outside, but we were very pleased once we entered. Our room was huge and very comfortable. Parking is free, in a courtyard accessible from the back of the hotel. The breakfast in the basement restaurant was very good - good variety and quality. Dinners there were also good. The location is handy to both the old town and the newer pedestrian street. Very enjoyable stay. We did have to lug our luggage up some stairs to get to the elevator, but this issue is pretty common in European hotels. Although not the cheapest hotel in Kaunas, the Best Western combines good value with a perfect location between the Old Town and Liberty Boulevard. Many of the places you'll want to visit are within walking distance. The rooms are spacious and well equipped with tea and coffee making equipment, clean and functioning bathrooms with amenities, a fridge, a mini-bar and so on. Everything you might need. The buffet breakfast includes cooked options and is good value. The rooms are all different and unusual shapes, so if you don't like the one you're offered, ask if another is available. When we arrived, we noticed some of the lights in our rooms were not working, but I'm please to report they were fixed as soon as we reported the problem. The staff were friendly and English-speaking and they helped us with all our requests. The staff at this hotel are very friendly and helpful. This is my second visit to this hotel and I am sure I will be staying next time I am in town. 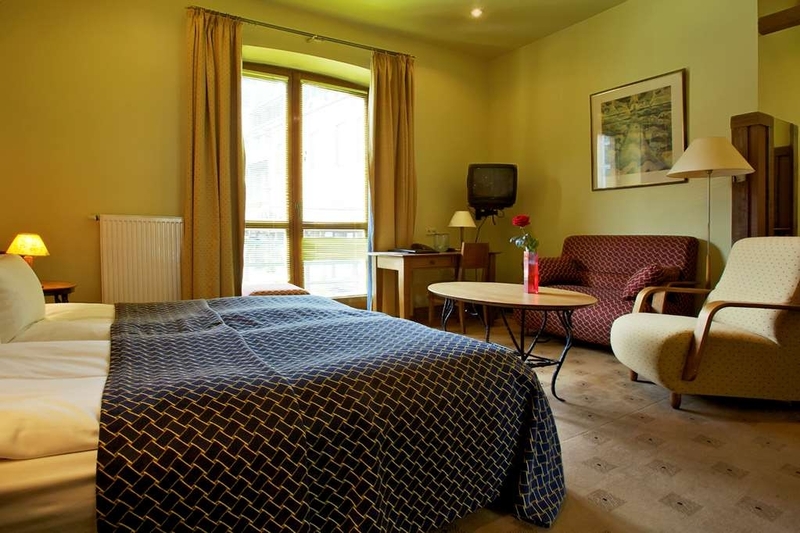 The rooms are well decorated, clean and the beds are extremely comfortable. 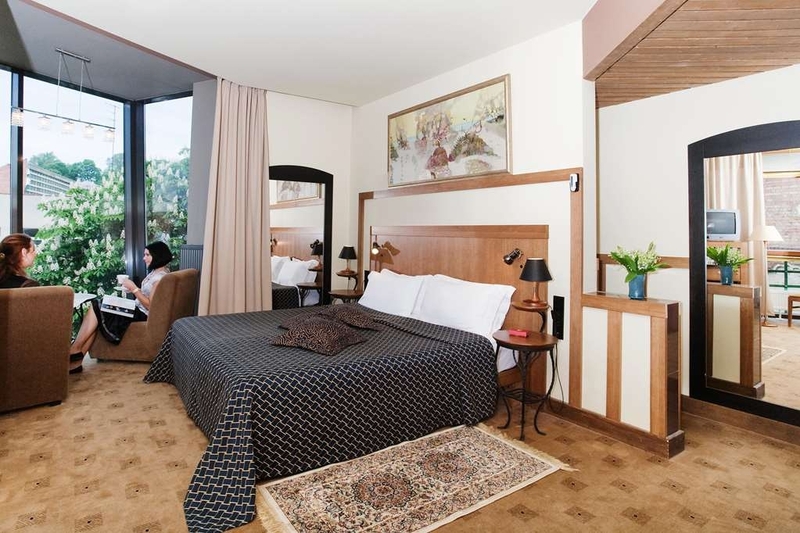 All rooms have air conditioning and are quiet, resulting in a comfortable and undisturbed sleep. The breakfast at this hotel is also very good. "Best hotel in two weeks in the Baltics"
They say you can't judge a book by its cover and arriving in the street outside the hotel I thought that this hotel was going to be a bit of a dive. I could not have been more wrong and I would say it was my favourite hotel out of the six I stayed at in the Baltic republics. Straight away I was impressed by the initiative shown by staff when helping to unload the baggage of our 16 tour members from our bus. The same young man also thoughtfully helped some of the older members of the group to carry bags without canvassing for a tip. The reception is a characterful if not small area with friendly staff. I was given room 508 easily accessed by elevator. I was very pleased with my room which again was full of character and extremely well kitted out. It had everything including the only tea and coffee making facilities I had seen in a Baltics hotel. There is good Wi-Fi and TV with English language channels. The TV is also on a turntable so is easily viewed anywhere in the room. Good air-con and even alarm clocks are provided. The room was very quiet, no road noise as its on a bit of a side street. No noise either from adjacent rooms. If I were to be picky I would mention the mechanism to the elevator just outside my room clicks when its between floors. I would also point out that as this room is on the top floor it is in the eaves. This is nice to pop open the Velux window and looks across the roves, but is a bit of a drawback for the shower as the ceiling slopes. This is acceptable if you are short like me but probably an issue if you are freakily tall i.e. over 6 feet high. Good breakfast, A highly recommended stay. I'll be considering other Best Westerns as a result. The sign on this hotel actually reads "Best Western Hotel Viesbutis Santaka". My room had air-conditioning - which we really needed in August. The hotel is at a great location between the old and new towns. The central location allows you to be a pedestrian for the length of your stay. Rooms are larger than typical Baltic rooms. The toilet has its own room. The furnishings have a lot of wood molding and overall it makes the room appear a bit dark. My third-floor room had a balcony and two chairs. There was a kettle in the room. There is a mini bar and a safe. The heated towel rack helped dry some laundry I did in the room. The breakfast area was very cramped. There was a decent selection of items but nothing elaborate. There is a tiny pool that really should a hot tub due to its size. However the water is not hot. There is a sauna. My room had two sets of terrible looking blinds. They really looked awful – I can't believe the hotel would not replace them. I could not get the curtains to completely block out the light. The worst thing about my stay however, was the hard bed. The bed is the most firm that I have slept on in recent memory. It did not make for a comfortable night sleep. However the air-conditioner felt great and the air conditioning fan did drown out some of the nearby city noises. My wife and I stayed here after a friends wedding, we admittedly paid a bit extra to have the larger room and it was definitely worth it. It was bright with large windows, up to date and very comfortable. It was in a quiet location just off the main walkway with lots of restaurants and cafes. Would of happily stayed there for longer if we had more time. I've seen a couple of reviews saying the staff were not great but we found them to be great help!! "Lithuanian knitting trip July 2017"
Great location. Our room had two book benches so that you can hang your coat and backpacks at the door. Even though there was a road outside the window, it didn't disturb my sleep. Buffet breakfast had the usual European selection. "One of the best value hotels I ever stayed at"
We were a group of 6 and had what probably was two double rooms with an extra bed in. Room was big so it was no problem. Very nice rooms, comfortable beds and in general good condition. Enough storage for three people too. Big bathroom with fairly modern fittings. The staff was very friendly and helpful, organized taxi for us, allowed a little later check out and let us store luggage. Breakfast was very good, alot to choose from and quickly refilled. The hotel is very cozy, and location is excellent. I don't know if we were very lucky with the price, but this is probably the best value I ever got. I highly recommend this hotel. This hotel is tucked away on a side street. At first glance, we were pleased as it was in an old building with lots of character. The staff, however, was unhelpful. The bed was incredibly uncomfortable, with a mattress so thin it really was no mattress at all. .
"Dark rooms, old and worn out furnitures. Affordable and working distance from city center. " Wasn't sure what to expect when I arrived at the hotel, however I was very pleased by the welcome form the staff, made to feel very welcome indeed. The room we were allocated to was very clean and well furnished. We were there for the Marathon and staff were very helpful in pointing us in the right direction. Breakfast was very good with a very wide range of food on offer. All round an enjoyable trip in a very nice hotel, and most of all the Lithuanian people were very nice too. My room had some nice amenities such as a refrigerator and a toilet room separate from the main bathroom. Also, the breakfast buffet was complete and nutritious. However, there were some flaws. Housekeeping skipped cleaning vital areas of the room and never replaced my tea and coffee until I finally inquired about it. Secondly, the balcony door was not attached properly to the top hinge, and the maintenance person showed me that if I closed the door properly, it wouldn't be a problem. I found this troubling. He should have fixed the door as it was a hazard. Also, be aware that the sauna is only free to guests during breakfast hours. Otherwise, you have to pay 15 euros per hour. Quite unreasonable considering the cost of the room. So, good and bad points. I'm not sure if I would choose this hotel again based on my experience. I've been to the hotel as a group manager, the hotel located near the old town and center. The reception is a bit cold as well as a bit problems with the english, but nothing seriuos. When you get the key ask which building you at, so you won't get lost. I've got suite number and it's very wide. Free wifi. The dining room is wide but the choise is less but tasty. Good value for the money. I stayed in this hotel during my business trip. The location is very good, just 100 metres from the Kaunas main pedestrian street. It is an intersting building, with many passages and corrisors, little hard to remember at the beginning. I got a spacious room with kinda glass alcove overlooking the street - very nice! The sleep quality was very good. The only drawback was quite limited breakfast. I cannot quite understand why as during the day the restaurant offers really nice and inspiring dishes. But breakfast was just an average, even below the standard of 4 stars hotel. Coffe was not good at all, no black tea (just fruit teas), eggs were definitely made from powder, staff not able to clean the tables on time (well the restaurant was full, however they must be prepared for such ocasion). If not the mediocre breakfast, for sure hotel deserves 5 rate. One important thing - quite big parking inside the backyard. Although sold as a four star hotel, I'd consider it a three star hotel. My room was worn and not very functional. The bed was comfortable though. Had an issue with not having any towels, but that was corrected immediately by the staff. Very nice and helpful staff, and the breakfast was the best I've had in Lithuania thus far. "Very centrally located,nice and coisy hotel"
It is very pleasent ,centrally located nice hotel with big and nice rooms. Breakfast was very good.Sauna and pool need some refurbishment so.. But overall I would highly recomend this hotel for families and friends. 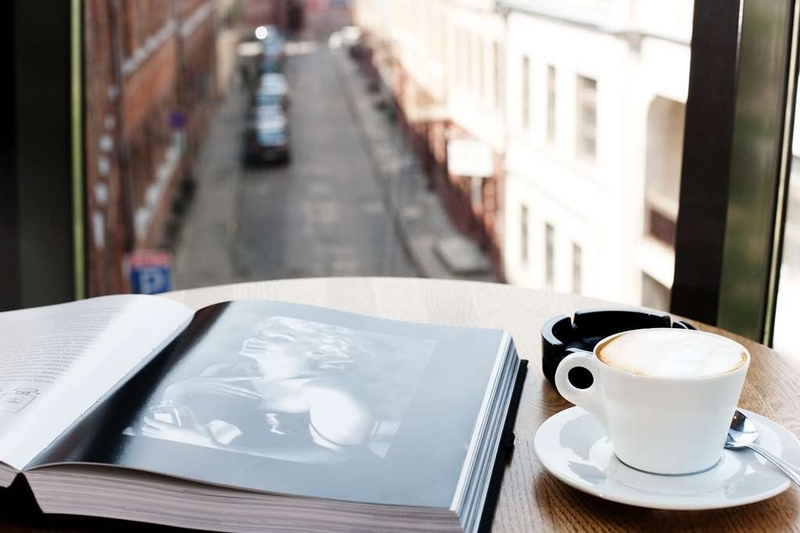 "We spent a few days in wonderful Kaunas"
There is a lot to see in Kaunas the restaurants and cafe`s are very lively. The hotel was old fashion Russian with dated furniture. The hotel`s entrance was hard to find but the free parkingspace was excellent. Breakfast was lavish. "definitely not a 4star hotel"
We stayed 9 days. The breakfast was good with variety of food. We were family with small child (3 years). Cleanliness was unacceptable. Minimum wiping with vacuum. The cleanliness of the toilets was unacceptable. They didn't clean the basin of the toilet at all. They came to clean the room after 15:00 same days. And at the check-out they charge us with a local phone call of 15€ which we didn't make it because we don't know anyone in Lithuania!!! When we complained they told us that the system was automatic and it was certain that we did make the call. The worst staying for all the vacation we have made adroad. The hotel is well located (five minutes to the main drag which takes you to the Old Town), with well appointed rooms and comfortable beds. The rooms aren't massive, but they have character. Also, the lobby is a bit cramped. No safe, but good free wifi. An excellent breakfast with a choice of meat, eggs, cheeses and local specialities. In conclusion a perfectly acceptable stop if you are passing through. I stayed in a single person room at the best western - it's a great location in terms of exploring the city of Kaunas. The hotel feels a little dated though - especially the labyrinth downstairs - I hear there is a swimming pool on site - it was never found. The staff are efficient and friendly and do a good job. It's a 3 star hotel and at best I can only give it 3 stars. My bed was creaky (room 318) and the mattress not really thick enough - the shower curtain wasn't big enough so it meant having a shower made the entire bathroom wet. However despite this - it's still a good place to stay and if you feel like you are getting a good price then it's worth staying here. Hotel lobby is too small especially for tourist travel in a group. Room size is ok and comfortable and Location is near walking street. Breakfast is just too simple and limited choices of bread and service is slow . "Nice hotel and conventiently located"
Fairly standard hotel with features you can expect in such a place. We had a corner room with a view on the street. They offer a nice seating area to watch the street below. The location close to the city centre is an advantage as you can explore Kaunas on foot. "Nice hotel near old town"
Stayed just one night at this historic BW hotel just steps from the old town. Parking is free, but a bit narrow. Wi-fi also free and fast. Room 415 was clean, nicely appointed, bed quality excellent, breakfast in the basement also very nice. It was cold in the room, so staff brought heater to keep us warm. Also, price excellent for the quality you get. Recommended. "Nicely done up in good location"
Stayed one night during tour.. Rooms pleasantly modernised with an art nouveau touch. Location great close to where the old and new pedestrian streets meet. Handy for sightseeing, shopping and eting. Cosy basement breakfast room is hard to find, but has pleasant conservatory area. The hotel was in a good position to explore Kaunas, just a couple of minutes from the pedestrian shopping street. The old town is around ten minutes' walk, use the underpass to cross the road. The nearest large shopping centre is Akropolis which is around twenty minutes' walk away and there are plenty of buses/trolleybuses nearby. When we left the airport, we turned left and walked about one minute to the bus stop for the number 29, where the buses run twice an hour and for 80 cents each we got a ticket into town (alight at the E. Ozeskienes g. stop). The hotel is on the next street down, so we turned right when leaving the bus and followed the uneven, paved walkway (Vilnlaus gatvé) until we found the road to our left. The road was not obvious, so our map helped (there is currently some graffiti on the wall where the road starts). From airport to hotel took around fifty minutes. Look for a dark wooden front door, which is the entrance to the hotel. Picking up our key from the receptionist was quick and straightforward. We took the lift to our room. The room was a good size with a separate toilet with washbasin, a shower/washbasin room, both of which were relatively small. The shower room had a heated towel rail, mirror, shaving mirror and a hairdryer. The main bedroom had two paintings on the wall and two single beds that were comfortable. There was a bedside table on both sides and a reading light/lamp. The curtains/shutters blocked out light at night and there was a good air conditioning unit. There was a room safe and mini-bar (not cheap). There was a desk/chair with a kettle with tea, coffee and creamer, which were replaced when used. There were plenty of power outlets. There was a small table and chair in front of the large TV but not many stations, not all the ones listed in the hotel guide, as we did not get Sky News. There was a wardrobe with mirror and a separate coat-rack. There was good Wi-Fi in the room. The room was quiet at night as the road does not get much traffic. The breakfast room is downstairs – keep going until the end of the corridor. 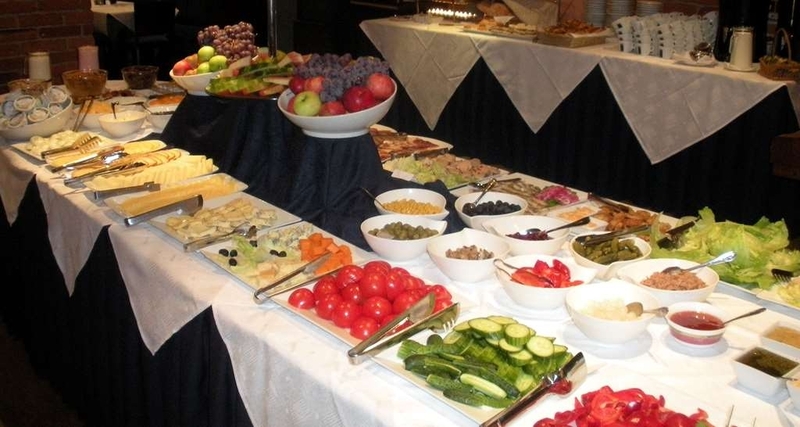 There was a good selection at the buffet breakfast: coffee machine, a variety of teas, hot/cold milk, yoghurts, cereals, fruit, breads, olives, honey, salad, tuna, herring, cakes, biscuits, cheese, hot/cold eggs, continental sausages and bacon (a change in the hot items each day). There is a toaster (watch the step up in this area). The orange squash was over-diluted to our taste. It may be difficult to find a table if there is a large group staying. Used crockery was not cleared while eating. Checkout is up until noon. Luggage can be left in a room near reception. The return bus to the airport (number 29) goes from the Laisves Aleja stop opposite the Kauna Alus brewery. There are around one or two buses per hour depending on time of day and the journey takes 30–40 minutes. We bought a 3-day pass for the bus for convenience, but pay-as-you-go might be cheaper if you don't need many journeys as there is a small charge for the card. They offer a taxi to the airport for 18 euros which is twice the price of a standard taxi fare. Take ID or your passport if you want to buy alcohol at the supermarket so you can prove your age. We would stay there again. A very comfortable, clean and spacious bedroom and bathroom. Quiet location with on site parking. Reception staff very friendly and helpful. A pleasant change to find coffee making facilities in the room. The hotel has a few steps into the front and rear entrances as well as a couple of steps between reception and the small lift. The walk to the old town square and main location for the local restaurants is around 10 minutes gentle stroll along the flat, albeit cobbled street. However approx 100 metres after leaving the hotel there is a wide busy road to cross or an underpass with steps to navigate. All these factors combined would create difficulties for someone with mobility problems. As stated by other reviewers I was very surprised to be told that the facilities (pool and sauna) were only free to guests between 0700 and 1000. Thereafter the fee was 15 Euros for 1 hour! I have never been asked to pay for such facilities in other Best Western hotels but even if a fee is thought necessary this is an exorbitant charge, especially as I gather the pool is only a small one. "Had everything we needed "
Situated in a narrow street in what seems to be a converted old building so you have to carry your luggage up a few steps from the street to check in and then half a flight of stairs from there to get to the lift. Room was comfortable and had tea making facilities in the room which I find not all European hotels have. Also more than one pillow each and a plug in the bathroom. Again not all have one and it is useful. Well located between the pedestrian streets of the old town. Breakfast was a bit of a problem for me as a vegetarian. Though they had scrambled eggs (the only hot non-meat dish), they put bacon on top of it in the bainmarie, which meant I could not eat it. Good location at the main walking street near Old Town. Short walk to most sights in Kaunas. Also a good shopping mall Akropolis is in 15 min walking distance. Hotel is in old industrial building. All renovated. Rooms had space enough although not so big. Good shower, exellent bed and fast wifi. Breakfast was abundant. Specially we liked the coffee made from fresh beans in coffee machine. Front desk service very friendly and helpful. The hotel it is well located, in the middle of new and old town and walking distance to a big mall. It is well renovated and the rooma are big and comfortable. Breakfast it is tipycal continental and various. The staff kind. If I will be again in Kaunas I will came back. We arrived as a big group and all keys were ready for our arrival. The rooms were spacious and had 3 single beds which was perfect. The beds themselves were comfortable. Everything worked, the Internet/wifi was fast. The breakfast the next morning was buffet style and of reasonable quality. I would recommend this hotel. This was all good! A warm welcome on arrival with an efficient check-in. A decent size of room, with a comfortable bed and air conditioning that worked. A good view from the room and a quiet environment for sleeping. Helpful staff when asked for guidance or advice. And car parking, although this is a bit cramped. The layout of the self-service breakfast maybe needs some more space to avoid people crowding around in a small area, but the breakfast itself has lots of choice and was plentiful. Really enjoyed staying here. This hotel, though situated in an old building, was beautiful inside. We had a small room on the 5th room but it was more than adequate except for the sloping ceiling and difficulty for short person to open windows. The breakfast buffet had a good variety of food, although a sugar-free cereal would be appreciated. The only problem was the shower which had a very short curtain and was so slow to empty that there was danger of it running onto the floor. "Stylish, quiet, great location near Old Town"
Convenient access to old town in about 5 minutes. Room was lovely, large with a roomy separate bathroom. Breakfast was very good and extensive. Facilities were up to date and modern. Bed was very comfortable, window curtains blocked the light. We stayed in hotel for less than 8 hours but wished it was a longer stay, because of the facilities. Our room air conditioner was not working. After a tedious and confusing conversation with the hotel staff and an apparent lack of available spare rooms, we left for old town and dinner. When we came back after midnite, the hotel receptionist Vesta, had been looking for us. She had an upgraded room available which had been pre-cooled. With the help of Michael (sic) we moved. We were grateful to Vesta for being so understanding. We did not use the TV nor the WiFi. 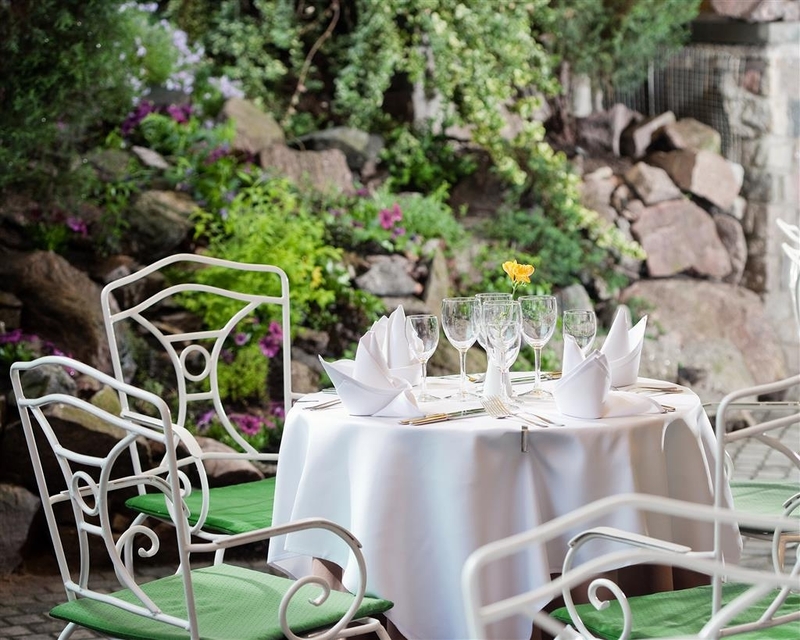 "Traditional feel with modern comfort"
This hotel is conveniently located being only a 5 minute walk to the Old Town. Lovely to stay somewhere with character, although it's a shame they felt they needed to put a Best Western sticker on the bathroom wall! The staff were very friendly and helpful. The room was spacious with desk, sofa, chair and the bed was comfortable. The separate bathroom was also roomy with hairdryer and toiletries provided, although no body lotion. The shower worked fine but it was over the bath and the base of the bath didn't feel very strong and I also prefer a screen to a curtain. Breakfast was very good. We also ate in the hotel in the evening because we arrived in a thunderstorm and torrential rain and enjoyed the food which was very good value. Free (and secure) car parking a bonus, although it was a tight fit. Would definitely recommend. "Best value for money ever!" Great hotel with friendly and professional staff. Easy to find. We stayed in 30sqm "suite" and I have to say it was perfect!! Secure parking in the backside of the hotel! Restaurant is also amazing - the quality of their offerings is just great! All in all greatest value for money that I´ve experienced in a long time!! "The perfect stay at Kaunas"
We had a large, quite luxurious twin room, with nice furniture, a pleasant rooftop view - and I especially appreciated a kettle to make tea! Very clean; spacious bathroom; efficient air conditioning; comfortable beds. Just a short walk to the Old Town area. Decent hotel that's a little dated but smart and clean. Helpful staff and fantastic FREE breakfasts - great selection. One problem - the room we had was the site of a large very deep bath with no safety mat etc. I said to my family - "careful, that bath in there is great for bathing in but a death trap".......sure enough my wife fell in it. You aught to see the bruising. Safety mat and a well situated handrail would solve the problem. "Light and spacious room, interesting building"
Stayed for 3 nights - had a corner room with high glass window overlooking the narrow street towards the pedestrian area. Very nice large spacious room, WC and bathroom in separate rooms. A very short walk to the main pedestrian area linking to the city centre. Reception staff very helpful - including arranging laundry. Business room - printer out of ink, reception staff didn't seem to know how to replace the cartridge. Breakfast - located down a flight of stairs and along a corridor (tricky to find at first!) was fine, though the dining room seemed small for the number of guests - sometimes might be hard to find a free table. Staff had to try hard to keep up with refilling breakfast items. We also used the conference room downstairs - good size for a group of 20-30. Adjoining room was used to welcome/have coffee and snacks. Well organized by the hotel. This hotel does not look like a Best Western as we know them. A narrow street and a red brick building, narrow corridors and small stairs but: A great spacy room, fantastic bathroom and good restaurant. We liked it very much! Save parking and good service. Location close to old town. "The Best is not the best"
I stayed in the hotel on 19-20 Apr. 2016. The hotel has two great advantages - great location and a parking lot. The old fashion building from the outside is beautiful but the interior is also old fashion. The room size was OK but need a renovation. Breakfast was OK. The staff was friendly until you need something they don't have the answer. The temperatures outside were very low and the room was frozen. The air condition was not of use for heating. I asked the Reception about heating. The answer was "we are out of season". Meaning "we stop the heating at a certain date, and even if the night temperature will be 0 or 1, we can re-operated the central heating system". I must say that our hotels in Riga and Tallinn had heating. The reception offered me a heater. How can you use a heater in room full with textiles as this room - carpets, bed, curtains, etc. "Great hotel - cheap price "
One of the best hotels in Kaunas, good location, 10mn walk from the bus station, 5mn from the main pedestrian area, the building is amazing, all staff speaks English, nice breakfast and large bedrooms, a place to go. Nothing to complain about. "Nice but quiet Hotel in town centre. Curious facts about "free" sauna"
This hotel is placed near town centre. Short walking distance to the old center town. The breakfast is good, there is a bar and a garten enclosed. One curious thing is the sauna which you might use free of charge in the morning until 10 o'clock. Really? I had to ask two times because this is like a bad joke. In the evening you might use sauna, too. But then you pay 15€ per hour for that. My wife and I stayed here last year for several nights. This is a very nice hotel close to Old Town and Laisves Aleja (Liberty Boulevard). The staff is very nice and speak English very well. Our room was nice although the elevator didn't go to our floor. You had to take the elevator up, get off and walk down a hall, and then take stairs up to our floor. Not a problem unless you're lugging a heavy suitcase. The restaurant is nice and we even had my wife's birthday party there. We'll definitely stay here again on our next trip to Kaunas. Excellent location in Kaunas, very handy and close to everything. Great value. Staff were very friendly and helpful. Our room was perfect, very big, clean and comfortable. I would definitely recommend it. This hotel in the centre of Kaunas may not be imposing when you arrive at 11pm but the interior is superb and the staff are very professional and helpful. The rooms fit in with the old blocks of the premises well. The available options at breakfast were extensive and provided a good start to each day. "Clean comfortable room in good location"
We stayed here for the weekend and really enjoyed our stay. We had a huge corner loft room that had windows with views in three directions all across the city. There were tea and coffee making facilities in the room and a basic breakfast buffet was included. The location on the edge of the old town was excellent and meant we could walk everywhere. The staff were friendly and extremely helpful and even arranged to have takeaway breakfast boxes ready for our 4.30am hotel departure because they knew we had an early flight. The only problem was an odour in the stairwell however as I smelt the same smell at various locations throughout the city I suspect it is a problem with old drainage in the city rather than the fault of the hotel. I would definitely stay here again as it was good value for the price and location. "Good choice in a great location "
We stayed here for three nights in January. We loved the building which clearly has some history to it although still modern. Our room was big but was hot a lot of the time. The bathroom was well equipped but the shows was so powerful it flooded the floor. Breakfast was a great selection although I would say that they should provide separate tongs for the eggs than the bacon for us vegetarians or those with religious needs. It's a great value hotel in a very convenient location so worth staying. We stayed here one night. The staff was nice, breakfast was basic but our room had a fantastic view at the old town. Large windows from ceiling to floor. We liked that we could bring our dog. The parking however can be tricky due to limited space. You should know your car and it's dimensions to be able to navigate into the tight spots. Beautiful hotel,spacious cosy room,incredible choice of breakfast-thought could please anyone! :)Free sauna and swimming pool until 11am.Very friendly and helpful staff.Hotel close to old town and central promenade,was easy to enjoy every minute of it and to see a beauty of the city and to be home.Definitely going to stay again and would recommend to friends or visitors from other countries. "Not bad not great. " Good location, nice interiors (though is kinda hard to find the restaurant). Room clean and cozy. Nice service. Breakfast - not that good - totally overbooked eggs, some strange sausages - but nothing lethal. Generally - positive recommendation. "Nice Hotel in a good loaction"
The hotel is in a an old refurbished building and has been modernised well. We had a suite which was very large with separate WC and bathroom. The best part of the room was a the corner bay window, the glass was floor to ceiling and there was a table and 2 chairs in it, a great place to sit and watch the world go by. Breakfast was a typical buffet spread with everything from raw herring to bacon and eggs, slightly over keen staff would be my only criticism, if you left your plate for 30 seconds it was whipped away! When it comes to staff thats where the hotel could improve greatly, walking in to reception it was like you were interrupting the receptionists conversation. There was no offer to carry bags to the room or show you the way to it, any queries were met with general indifference. This indifference is a cultural thing as we found the same in shops, bars and restaurants throughout Lithuania. The location is good as its only a 5 minute walk to the Old Town and 5 minutes the other way to the main shopping street. As for value the hotel is very good, less than £50 a night for a large suite with breakfast, if you have a standard room its around £40 a night! 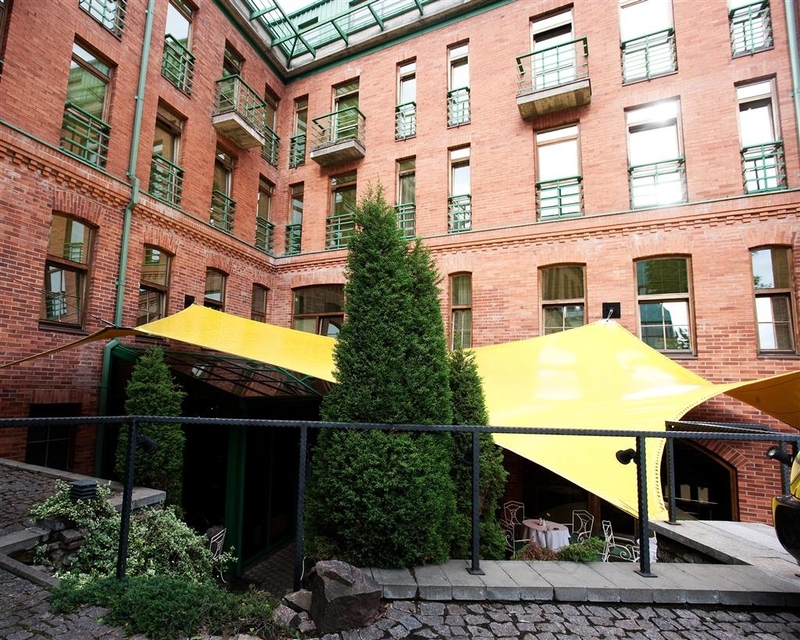 "great hotel in the right area"
Lithuania is filled with lots of rich history set in well-preserved Old Town areas. It would be hard to beat this vacation experience if old world history and charm are on your radar. All the rooms in the very reasonably priced hotels we stayed in were larger than any we've seen in other European cities. 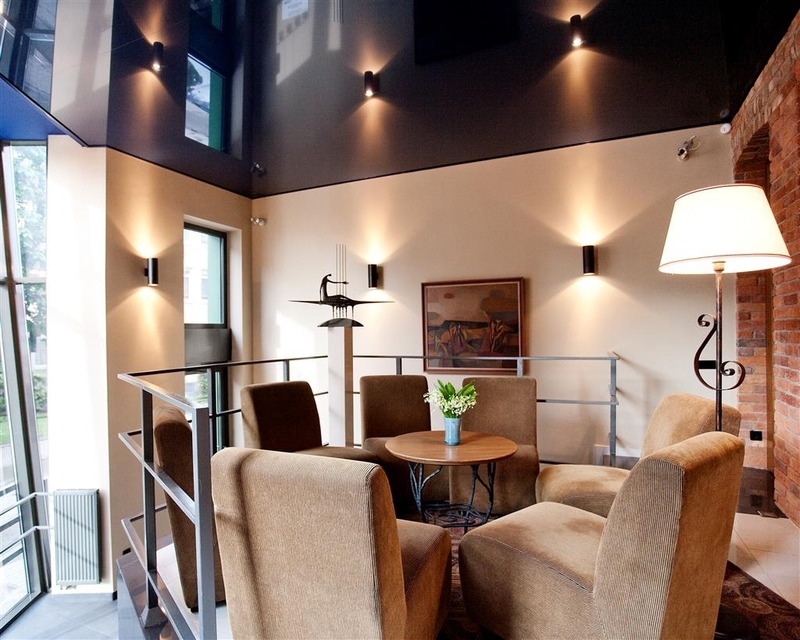 Santakos is a modern hotel set inside an old building in Old Town next to a music school. This hotel has convenient on-site parking, however, driving and parking in an Old Town area is always challenging and this was no exception. We easily missed the turn down the narrow street to access the lot behind the hotel. The helpful staff let us leave the car there for several hours after we checked out. Santakos is run more like a nice Best Western might be run elsewhere. For an Old Town hotel, it is bigger than most and has an elevator. The breakfast room and restaurant were much larger than in other hotels but still very nice. The breakfast buffet offerings were quite good with a lot of variety, but we were disappointed with the hot entrees. We also ate supper there one evening and enjoyed our meal. The location is excellent for access to all of Old Town. It is just off the main pedestrian boulevard. You can easily walk to Town Hall Square, as well as the castle and park beyond that. We even walked to the M.K ?iurlionis National Art Museum – very impressive and worth your time. Our room was new, modern, and regrettably, like in many modern hotels, style trumps function. But it was clean, pleasant and comfortable. What we disliked: We had just been to 3 other hotels in Lithuania where our breakfasts were quite good. While the buffet was very nice, the hot entrees at Santakos were disappointing. In addition, on our first morning the breakfast room was quite crowded and noisy. The other two mornings were much more to our liking. I stayed there one night with my two kids. The room was large and clean, the staff friendly and attentive, the breakfast great (although all four varieties of eggs were overdone.) The staff even came with juice boxes for the boys, which they really appreciated. A small minus for the pool, which is not meant for swimming, but for dipping after a stay in the sauna. We visited this hotel during mid august 2015. Hotel is very clean and rooms are extremely spacious and comfortable. Breakfast was very good. Reception and restaurant staff were very polite and met all our requests. A special thanks goes Mrs.Inga. This was a holiday to remember. Les & Nat. Stayed here for 3 nights. Great value, extremely clean and comfortable in a nice wee street near the centre of town. 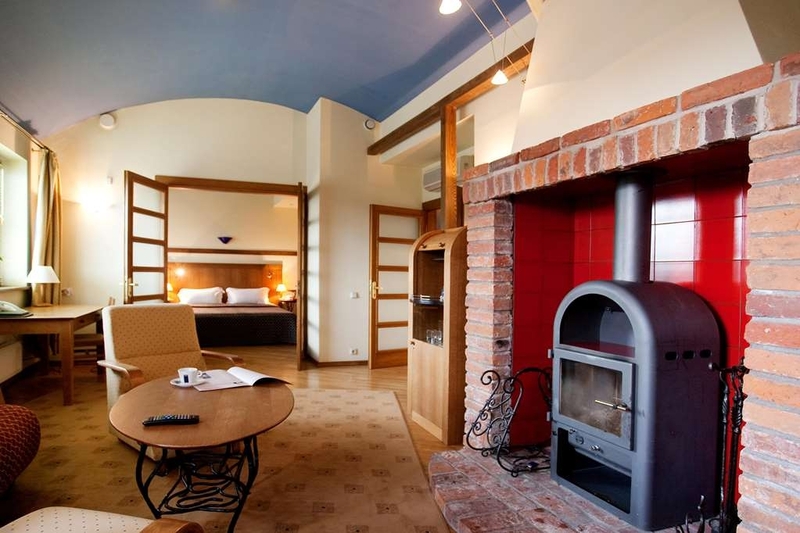 Kaunas is a charming town and this hotel is well appointed with pleasant and large rooms. Nice bar and an excellent choice at breakfast. Well recommended if you are staying in Kaunas.